It's been about as hectic a few weeks as I've had in a long time, so I'm sorry there's not been much to update on. Ironically, there's been very little worth writing, much less reading, in spite of this sudden deluge of activity, but I will continue anyway at the risk of boring you. First, most recently, and most excitingly at least for me, was the Canada Day release of our tenth FrankBlack.Net Podcast. This is a little radio show of sorts that I host with a friend from New Jersey, Brian, bi-weekly, and we talk about the latest news in the world of Frank Black, play tracks from albums and offer a little (we hope) insight, and thanks to his manager, Ken Goes, have a rare track to put on our podcast every time. 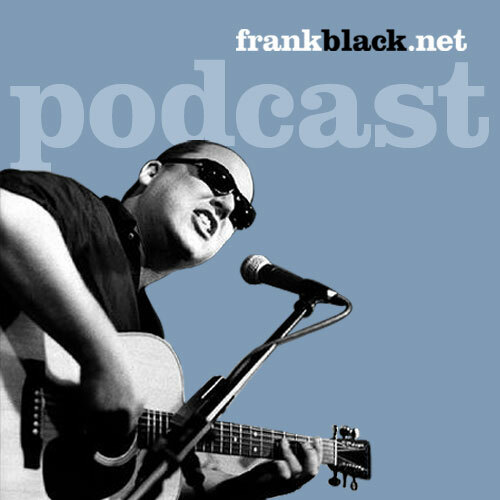 Not to some of our favourite live recordings, covers, and tracks from Frank Black fans. We started with a surprising 1500 downloads in the first two weeks we played it and now coming ever closer to 5000 subscribers. So it was with some excitement that we released our tenth episode, and we went all out to make it special. It's hosted at a swanky penthouse party at the halfway point between Brian's home and mine, Thunder Bay, and the most exciting thing, at least for me, is the appearance and conversation with Frank Black at this party! Yes, on July 19th, the day his new album, Fastman/Raiderman, that same day that the Edmonton Oilers lost Game 7 to the Hurricanes, Brian and I were chatting with him using VOIP. And this is largely thanks to his wife, before I go on, who helped us set up the interview with him and also was working on family friends Jack Black and John Flansburgh among others. Maybe in the future, but I digressed with the intent of thanking Violet, and will do so now. Thank-you! So, that done, we were chatting after a few initial technical difficulties, and chatting. We talked about everything from the new Pixies tracks that were recently trashed to his new album to his touring plans (with a band) to, well you name it. Spaghetti sauce. How songwriting is like making a sandwich. A very funny man and he entertained us for 2.5 hours before we finally let him go, and he didn't ask once despite a cold and, initially, the ruckus of kids getting ready for bed. If you want to listen, there are a few ways. You can listen/subscribe to the whole in iTunes, stream it from the web using Yahoo, or download the latest episode directly here. You don't need an iPod to listen to a podcast, just a computer with speakers or a CD burner. In other news that's exciting for me and less so for you, my sister finally got back from Europe/Greece late last week. Her backpack weighs more than her I'm pretty sure, or at least is very close to being on par. Or at least, it weighed, she is hopefully unpacked by now. It's nice to have her back home though she probably wishes she was still there rather than taking a summer version of Math 110. We had to trade her for my uncle, unfortunately, he was here a month but I only saw him three or four times. 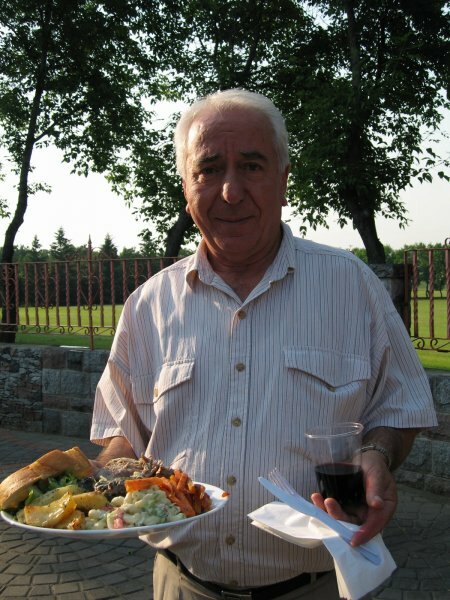 We had a barbeque before he left though, and it was nice to have some family and friends out. We also got very lucky with the weather; it had been raining for weeks on end and cleared up just in time for us. We had the lamb and tzatziki roast and a bunch of other good stuff, which you can probably see in the pictures I took. Click on the image on the right to check out some more. What else? Well, I've managed to get a few games of golf in this year and hope to do a little more of that this summer. Maybe this weekend I'll go with my dad. I went with John to his uncle's golf tournament a couple weekends ago, it was a 9-hole course in Watrous, and we had a good time. I wound up golfing with a relative of Brett's, what are the odds of that? Well, in case you thought that was a genuine question, the answer is, not very good. Not very good. But we all had a good time and a bit too much sun, hence to rosy hues. John also was good enough to invite me to his cousin's pool party on Canada Day, which was nice. They have a very nice backyard/pool, and we sat around, swam, and enjoyed the warm weather. His cousins seem like pretty cool people too.